Main Features: The most prominent feature of this model is its sight tool, which is the main improvement over the Gerber standard MP600. 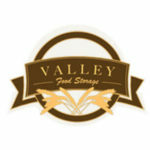 Use: Primarily designed for weapon maintenance and tactical purposes. MP600 Sight Tool is definitely an improvement over the Gerber military classic. The tool kept some of the best features of MP600 but also added some of its own, including a longer Phillips driver, a carbon scraper tool for weapon maintenance, a combined blade (fine and serrated edge), and a sturdy front sight adjustment tool. 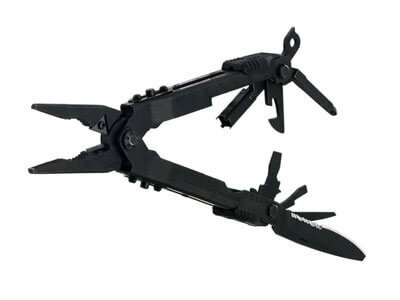 Gerber MP600 sight multi tool comes with a black oxide finish, which gives it a more sleek and tactical look. Since this is Gerber we’re talking about, the coating will never come off and end up on your hands or clothes. 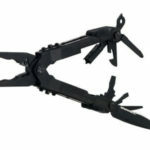 This Gerber multi tool features needlenose pliers with crimper jaws, M4/M16 front sight adjustment tool, carbon scraper, carbide wire cutters, fine/serrated edge knife, lanyard ring, long-reach Phillips screwdriver, black nylon sheath, and can/bottle opener. This tool comes with the same one-hand opening technology as its predecessor. So, if you see S.H.O.T. written somewhere, this is what the acronym refers to. All Gerber multi tools are made right here in the USA, so you don’t have to worry about compromising quality by purchasing a multi tool with outsourced part production and assembly.